Van der Poel was registered with the Guild of St Luke in Delft on October 17, 1650, where he is listed as a landscape painter. 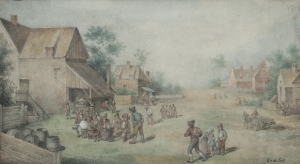 In 1651 van der Poel married Aeltgen Willems van Linschooten in Maassluis, near Rotterdam. His most famous paintings depict the Delft gunpowder explosion of October 12, 1654 and its aftermath; he and his wife were living in the area at the time. Egbert and Aeltgen van der Poel had a son and three daughters.